These flashcards cover important concepts that will help people understand property and rental contracts. Freehold Estate Anyone who owns property has a Freehold Estate. 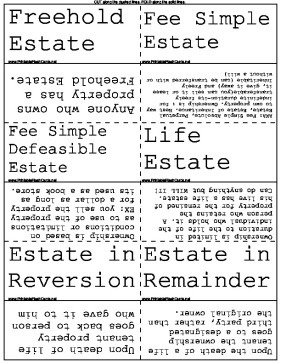 Fee Simple Defeasible Estate Ownership is based on conditions or limitations as to use of the property EX: you sell the property for a dollar as long as its used as a book store. Life Estate Ownership is limited in duration to the life of the individual who holds it. A person who retains the property for the remained of his live has a life estate. Can do anything but WILL IT! Estate in Remainder Upon the death of a life tenant the ownership goes to a designated third party, rather than the original owner. Variation in Life Estate A life estate may extend beyond the life of the life tenant. Usually when a person has a life estate designated in another persons life. Less-Than-Freehold Estate AKA Leasehold Estate-an estate that is owned by the tenant. The tenant is an individual who hires real property from the owner for the exclusive possession. Owner releases possession while remaining the owner. Lessor The landlord, when real property is leased or rented, the landlord has a freehold estate. Lessee The tenant-tenant has the less-than-freehold estate which is also called a Chattel Real. Lessee has right of use and possession of the property. Classification of Leasehold Estates Leases can be Definite or Indefinite in duration. Periodic Tenancy Period-to-Period. Either day to day, week to week, month to month or year to year. Renting on a quarterly basis. When a lease expires but the tenant stays and makes payments its considered to be renewed. Estate for Years Tennant has property for a definite and specific duration. Ex: from June 1st to August 10, or April 1983 to April 1984. An advanced notice is not required because the termination date is fixed in advance. Estate at Sufferance An estate where the lessee has the right to fully come into possession of thep roperty, retains posession after the expiration of the term without consent of the lessor. Can be terminated without notice. Estate at Will Lessee is in possession of the property for an indefinite duration and the tenancy may be terminated withotu notice of teh lessor or lessee. CA law requires that notice must be given so not used in CA. Requirement of a Valid Lease Name of parties, description of the property, amount of rent, term of lease. Combination Lease A lease that incorporates two or more different types of leases into one agreement. Percentage Lease lessee pays rent based on a % of the gross income. Usually with a minimum guarantee. Sandwich Lease A leashold estate that lies between the primary lease and the operating lease. AKA a sublet. Straight Lease (Flat Lease) Tenant pays same amount of periodic rent for the entire term of lease. Assignment The original lessee (assignor) transfers entire lease to new lessee( assignee) Assignee has primary liability then the assignor has secondary liability. Subletting The original lessee transfers a portion of the lease to a new lessee (sublesee). The original lessee remains primarily liable on the original lease. Tenant Cancellation Rights Any unreasonable physical characteristics of the property are made. Property is destroyed or condemned by eminate domain. Quite enjoyment or possessory rights are violated. Evicted by landlor, or a condition of lease is broken (ex: landlord is required to make repairs and didn't). Landlord Cancellation Rights Tenant commists waste and destoys the property. Property is used for illegal purposes. A condition of lease is broken. Tenant doesn't pay rent. Economic Rent expected rent a property may yield if it was available for rental at the time of appraisal. Severalty Estate The ownership of property by one individual. An individual who takes title in severalty takes title as the sold owner of the property. A city holds title ot parks, public buildings, and recreations areas in severalty. A corporation holds title to real property in severalty. Joint Tenancy Estate Ownership by two or more people. To own a joint tenancy there must be four unities time, title, interest and possession. Time All joint tenants must enter tenancy at the same time. Joint tenant can't be added at a later date. Title All joint tenants are named in one documents may be created by deed or will. Interest All joint tenants must have equal undivided interest. Possession All joint tenants have equal undivided rights of possession. One tenant cannot charge rent to another tenant or use and possession of the property. Right of Surviorship Joint tennant can never will his interest. upon death of a joint tenant his interest is automatically terminate. Would pass to the surviving tenants. Tenancy In Common Ownership of property by two or ore persons. To create a tenancy in common estate there must be one unity, the unity of Possession. Real Estate Syndication peopel join together to invest in real estate which otherwise would be beyond their individual financial resources. Corporation legal person or artificial person created by law that has the rights and powers which were given to it by the charter and by laws under which it was formed. It uses a practical centralized management system while giving stockholders limited liability. General Partnership Created when two people or more joint venture for a specific business purpose. Limited Partnership One or more general partners and one or more limited partners jointly venture for a specific business purpose. Real Estate Investment Trust (REIT's) A REIT may be created under federal law when at lease 100 or more individuals joint venture as a corporation or as an unincorporated group to invest exclusively in real estate and real estate financing. May be classified as equity trusts, mortgage trusts, or combination trusts.